So what's gonna happen with Sento and the gang this weekend? Read all about the title and summary for the 4th episode of Kamen Rider Build! 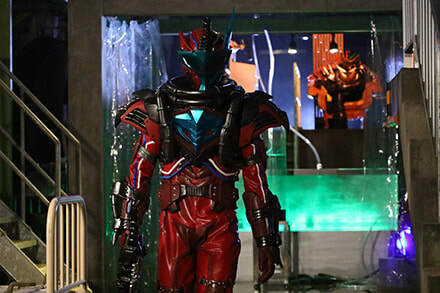 "After trying to capture the man who is responsible for framing Ryuga, Sento was attacked and poisoned by a mysterious armored figure with a cobra symbol but Souichi rescues him in the nick of time. During his unconscious state, Sento dreams about the human experimentation but this time, he sees the Pandora's box in his dream. He then ask Misora to gather information regarding the Sky Wall incident. Meanwhile, Ryuga arrives to Seito in order to protect the family of the man who framed him, Nabeshima, but Night Rouge appears before them!"